Size of this PNG preview of this SVG file: 600 × 600 pikseļi. Citi izmēri: 240 × 240 pikseļi | 480 × 480 pikseļi | 768 × 768 pikseļi | 1 024 × 1 024 pikseļi | 1 000 × 1 000 pikseļi. tagadējais 2010. gada 19. jūnijs, plkst. 11.00 1 000 × 1 000 (281 byte) Zscout370 Increase basic size, use viewbox. 2010. gada 16. februāris, plkst. 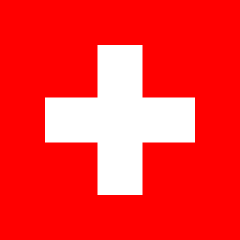 08.20 320 × 320 (280 byte) Reisio we don't work for the swiss government / aren't we trying to represent _real_ flags? 2010. gada 15. februāris, plkst. 23.33 320 × 320 (277 byte) Zscout370 I received another copy of the Swiss Government design manual; they stated for online use, the arms and flag must be #ff0000. 2009. gada 20. aprīlis, plkst. 19.42 300 × 300 (554 byte) Wright.one Fixed "No Character encoding declared at document level"
2008. gada 25. novembris, plkst. 09.36 300 × 300 (533 byte) Fibonacci Simplified code.